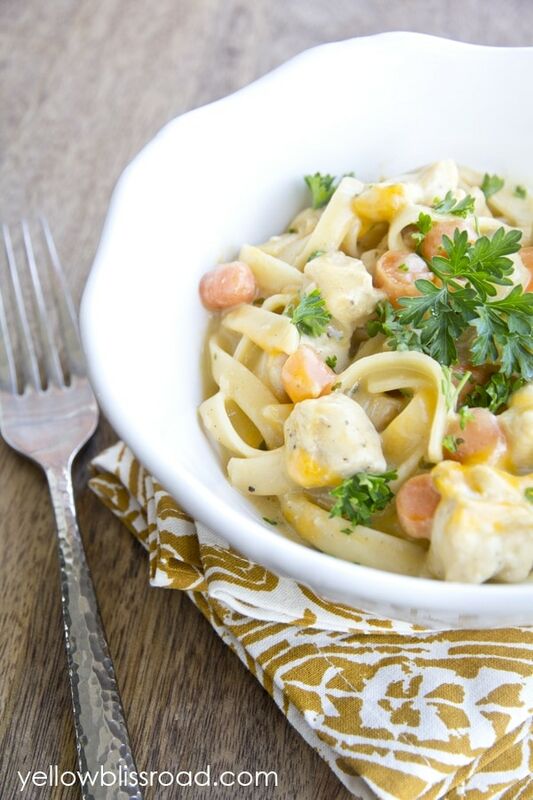 This One Pot Creamy Chicken and Noodles is a childhood favorite. 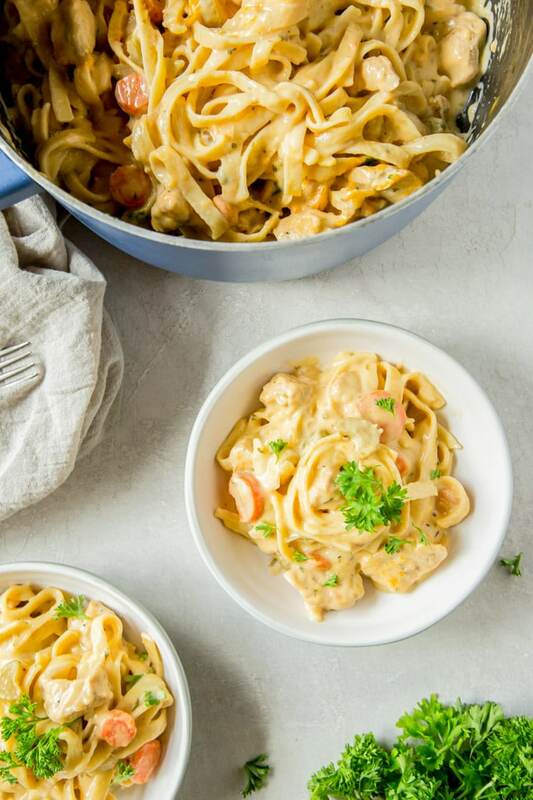 Full of tender noodles, chicken and veggies in a creamy sauce and cooked in one pan for easy clean-up, this recipe is a weeknight dream. 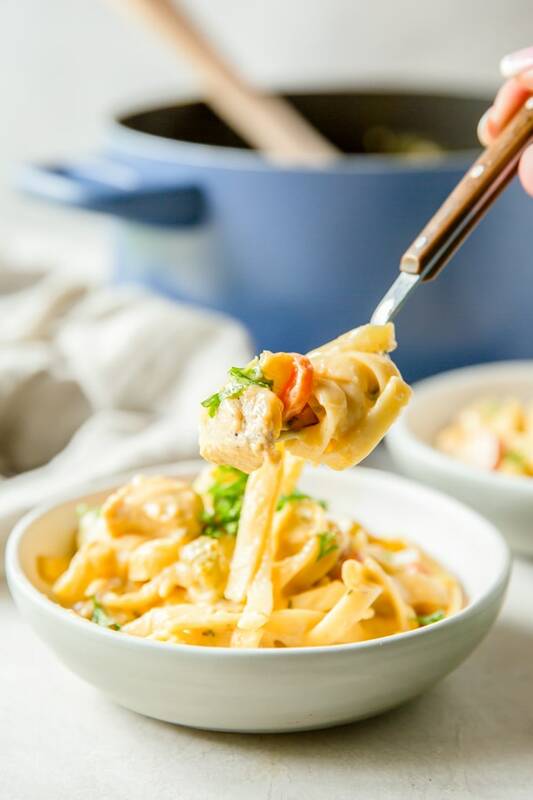 One Pot Meals have become a staple in our home and we especially enjoy One Pot Cheesy Smoked Sausage Pasta and One Pot Chicken Alfredo. 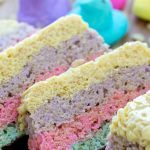 I love them for the ease of cooking and clean up and my kids love them because they taste really good! Cooking the pasta IN the sauce creates a delicious, rich flavor that you just can’t get when cooking in water. When I was a young girl I used to visit my aunt and grandmother often. My aunt used to make the best chicken and noodles! So rich and creamy and delicious that you couldn’t help but ask for seconds. I was wanting to recreate her recipe, but in a one pot version, so I got to work creating this dish. 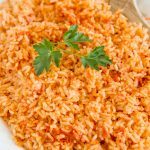 My cousins were talking about this the other day, chatting back and forth on facebook, remembering how much they loved this recipe from the grandma as kids. I had to chime in because I loved it too! It’s a great, classic recipe made modern with a few tweaks for simplicity. 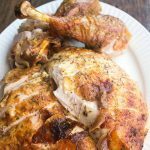 I hope that your family will enjoy this recipe as much as my family did! This is the kind of comfort food dreams are made of. 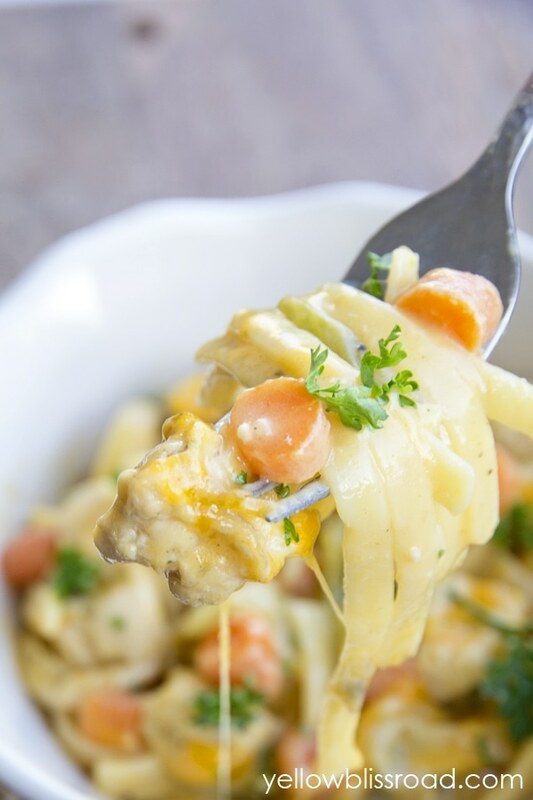 Seriously, so many yummy flavors melting together to create a rich, savory meal that the whole family will love. 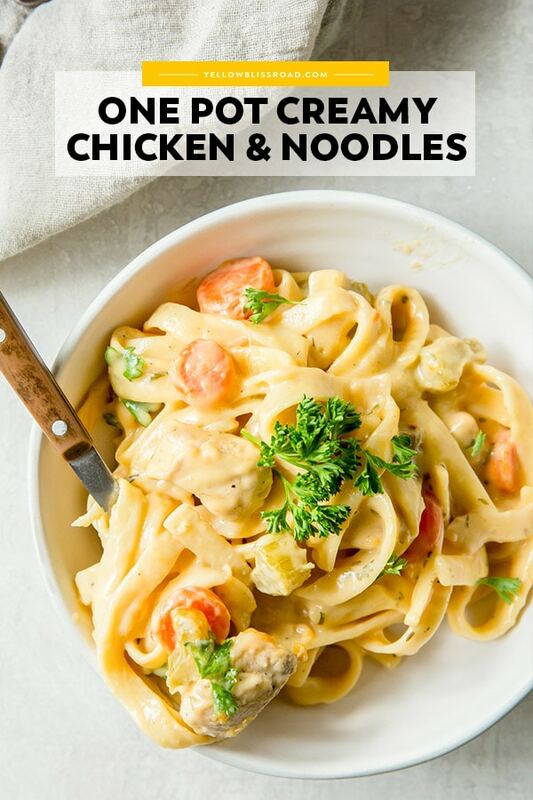 There are a few ways you could customize this recipe, like swapping out the fettucine noodles for a smaller pasta like rotini or farfalle. You could cut the cooking time by about 10 minutes if you do that. 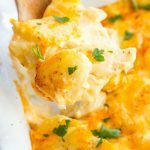 You could also swap out the sharp cheddar for something a little more mild like jack cheese or mozzarella. Adding some parmesan cheese would be fantastic! Or you could even leave out the cheese altogether. Saute the vegetables and chicken with salt and pepper until the chicken is almost cooked through. A little pink is ok; it will continue cooking later. Add the liquids, dry pasta and seasonings. Bring it all to a boil and cook for about 20 minutes until pasta is tender. Optional – Sprinkle with cheese and cover for 5 minutes to melt. Garnish with fresh parsley. See? Four super easy and simple steps! 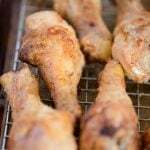 Can I freeze Chicken and Noodles? Unfortunately pasta just doesn’t hold up well to freezing and simply turns to mush when reheated. The sauce will separate and become grainy. If you have leftovers, I recommend storing them in an airtight container in the fridge and enjoying within 3-4 days. To reheat, add a little bit of milk or cream and heat on the stove or in the microwave on 50% power. 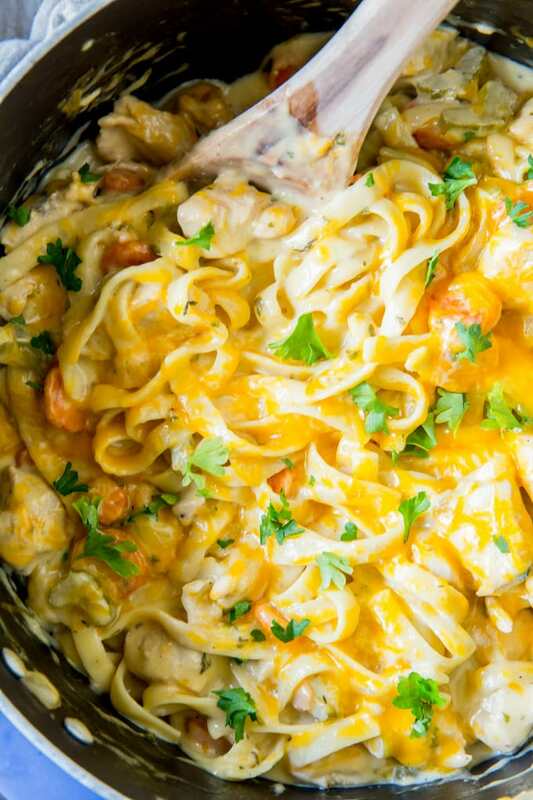 What tools do you need to make One Pot Chicken and Noodles? and that one is just as fabulous. Both are perfect for my one pot meals. If you don’t have a shallow saute pan, a regular soup pot will do just fine. Heat olive oil in a 4-5 quart pot or saute pan. Add chopped vegetables and minced garlic. Saute over medium-high heat for about five minutes, or until vegetables are just becoming tender. Add chicken and season with a couple pinches of salt and a pinch of pepper. Continue to saute over medium heat until chicken is no longer pink. 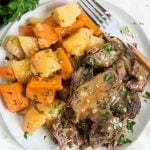 It does not have to be cooked through since it will continue to cook in the sauce. 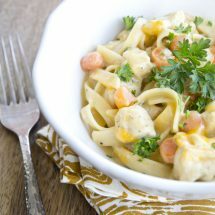 Add cream of chicken soup, milk (fill the chicken soup can), chicken broth, pasta and dry seasonings. Stir. Bring to a boil and turn heat down to low. Simmer for 20-25 minutes or until pasta is tender, stirring every five minutes to keep pasta from sticking together. Once pasta is cooked to your liking, remove from heat and stir in 1 cup of cheddar cheese. Sprinkle with remaining cheese. Cover pot and let rest for 5-10 minutes to thicken the sauce. Sprinkle with fresh chopped parsley for garnish. 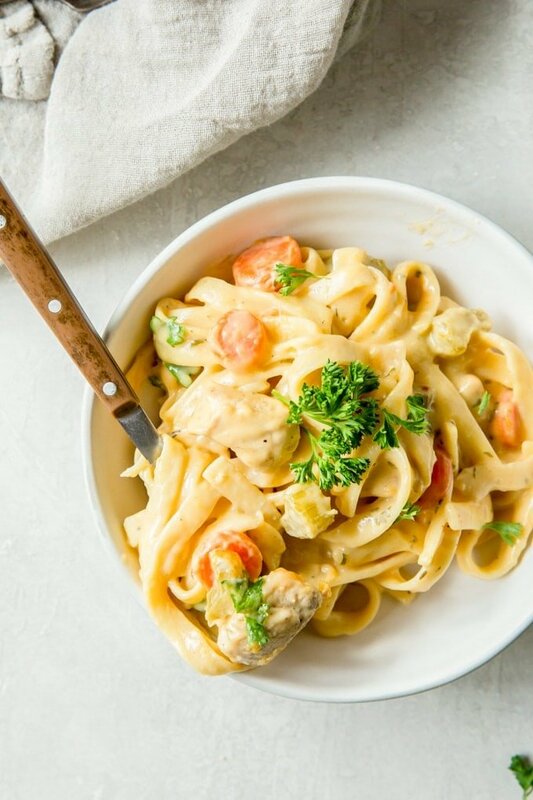 Instead of fettuccine noodles, try this recipe with your favorite pasta, from spaghetti to rotini! Glad you were able to make it work for your family, Lisa! This was quick, easy and delicious! Thank you for sharing! 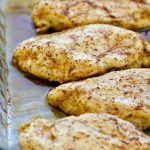 Do I leave the chicken breasts whole? Or do I diced them up? Cut them into chunks – I can see the recipe needs updating! Thank you so much for the rating and the kind words!! 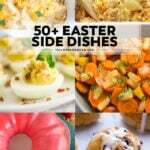 Cannot wait to make this for my family. Simply good comfort food. I used egg noodles as they were all I had. LIke a chicken noodle casserole. Very quick and easy. I found the thyme to be too much at 1 tsp. Very overwhelming to me. I would cut back next time to 1/2 tsp. Mushrooms would add a nice flavor if you like them. 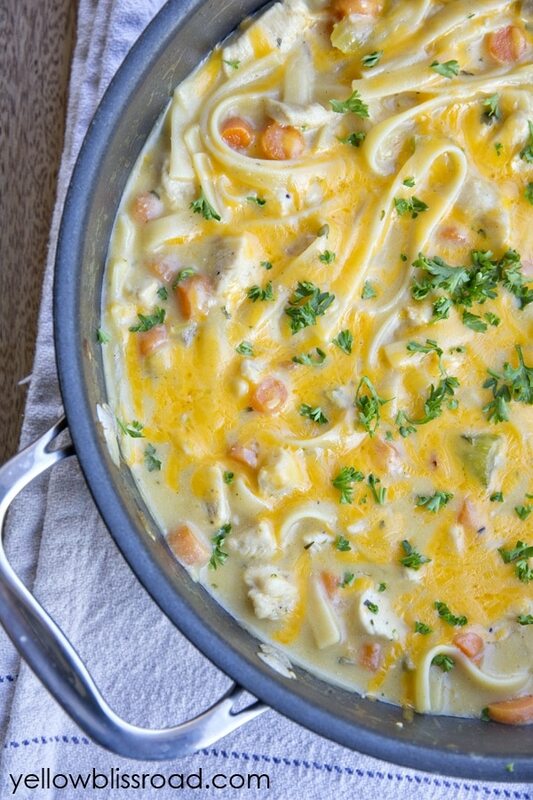 I’m making this right now, it smells fabulous! I made this exactly as written and it was a hit! Our guests had car trouble so dinner was postponed 20 minutes; I just added 2 cups of water and let it keep cooking on low and no damage was done. Everyone had seconds. This will definitely become a regular addition to our dinner menu. My son loves the leftovers from this meal So glad you enjoyed it!